The catalyst for this article was the London Model Engineering Exhibition in 2011. The Victoria Model Steamboat Club had an old hydroplane on its stand that bore a sign saying Arthur Cockman’s ‘Betty’. Although he had owned the boat at one stage, it had been passed to Gerry Colbeck, along with several other vintage hydros, all of which were loaned to the Pitsea Museum. When the museum closed, the VMSC initials on the boat and Arthur Cockman’s registration number V35 led to it ending up under the protective wing of Keith Reynolds Secretary of the Victoria Club, which is why the confusion had arisen as to its origins. Whilst talking to Keith it was explained that ‘Betty’ was actually a very famous and record breaking boat, and that it was not Arthur Cockman but the Innocent brothers, also VMSC members who had built and run it. This then raised the question of, who were the brothers, and what had Betty achieved that made her so famous in her day? The Model Engineer magazine is always a good starting point, and this showed the brothers listed in the results as L.S and J.B Innocent, surely not a very common surname meaning that I should be able to track them down relatively easily. In the event it was not as simple as I imagined and took a lot of work and quite a bit of luck to arrive at the point where I could relate the story of ‘Betty’ and the Innocent Brothers. Sam Lewis was born in 1904 and John Brewster in 1906 at 279 Roman Road, Bow East London to Lewis William and Elizabeth Emma Innocent. Lewis a Licensed Vitualler and Elizabeth ran the Ranelagh Arms in Roman Road from about 1899 to 1925/26. In the 1911 census there are five children listed, William and Vera from Lewis’s first marriage and then Sam, John and Lewis from his marriage to Elizabeth. In addition to the family there were seven staff listed including a nurse, a domestic servant, a servant/barman and another four barmen so it must have been quite a busy establishment. The Arms are still there to this present day, but modified by Hitler during WWII which removed several stories and it remained a single storey building for several decades. No longer a hostelry but at the moment a convenience store. The brothers became members of the Victoria Model Steamboat Club, Victoria Park being not that far away from the family home. Another VMSC member was Pierre Marechal running the hydroplane Old Bean IV. In 1932 he had won the Windermere Trophy for the fastest time of the year, irrespective of class at 30.75mph as well as a Silver Medal in Class B. 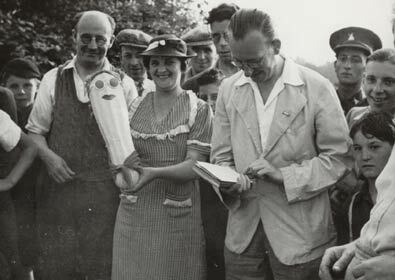 The report on the 1932 Speedboat Competition stated that Pierre was one of the youngest competitors and ‘incidentally one of the big surprises of the competition having in the last twelve months made remarkable progress’. Pierre was just 17 years old at the time. Sam and John were in their mid 20’s but whatever set of circumstances bought them together, they became great friends, with Pierre allowing the brothers to both develop and run his boat with Sam being responsible for rebuilding ‘Beans’ engine. They used this opportunity to compare the hull against those of the competition. They rejected the design of Old Bean’s hull as although capable of high speed, in their opinion it lacked stability. Instead they opted for a shovel fronted hull shape. This was the starting point from which they built a boat that they named Betty, possibly after their mother Elizabeth. The motor had been started some time previously, as in the first instance it was intended to be a free lance, model motorcycle engine, the idea of putting it in a boat not coming until later. 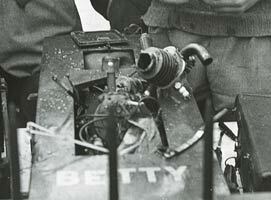 The hull however was finished before the motor so that it was initially run with a temporary motor. In the International race over 500yds they came 3rd with a speed of 30.7mph. being beaten by Gems Suzor’s ‘Nickie IV’ and Marechal’s ‘Old Bean IV’. However, in the 300yd Speed Championship Trophy they tied for first place, with their old friend Pierre. Following a rerun, ‘Betty’ at 31.25mph beat Old Bean IV’s 30.05mph. They both then went in for a long distance race with ‘Old Bean’ winning at one mile with an average speed of 31.9mph, but ‘Betty’ winning over two miles completing the course at an average of 29.2mph. Later in the year at the Farnborough MPBA regatta in September the brothers made a clean sweep winning the Championship Challenge Cup, the Open Speed Trial prize presented by Stuart Turner and the Farnborough Marrow for towing. It is difficult to believe, looking back from this distance, that racing hydroplanes would be used for other disciplines including towing. This involved the operator of the boat in question laying on a float or in the bow of a punt or skiff whilst hanging on to the stern of their boat, just above a highly revving prop and allowing themselves to be towed round a series of buoys. Possibly in order to avoid getting soaked with the water being sprayed from the prop, some held the bow of their boats instead and were pushed round the course. Towing events were the staple of regattas for many years. More success was to follow at the Grand Regatta where runs of 34.9mph over 500yds, and 35.69mph over 1,200yds both claimed as new World records. It should be noted that these were class and distance records as the outright record still stood to Stan Clifford of the Victoria Club with a speed of 43.3mph set in 1926 with his flash steam boat ‘Chatterbox’. The 500yard record did not stand for long as in the 1933 ME Speed Boat Competition they took the record for 30cc hydros to 36.03mph. In October the brothers crossed the Channel to compete at the Tuileries Lake in Paris for the International Regatta held by the Modele Yacht Club de Paris. The Bovril International Cup, 3 laps of 140 metres, saw ‘Betty’ dicing with ‘Old Bean’ and Mons Gem Suzor’s ‘Nickie IV’. ‘Betty’ won at 34.46mph beating ‘Old Bean’ and ‘Nickie IV’. The Grand Prix event of the meeting, the Kilometre Cup, seven laps of the 140metre course, was another similar tussle with ‘Betty’ victorious, beating Suzor into second and Marechal into third places. Winning both events was a first for an English boat, and cemented the fact that they had the fastest IC engined boat around at that time. Gem Suzor wrote to the ME saying that a crowd of over 3,000 people watched the racing. 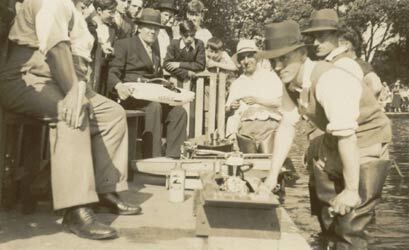 Later in October at the Wicksteed Regatta, held in Kettering the brothers added to their growing silverware collection. The Timpson Trophy for 500yds was apparently ‘the most handsome yet awarded for model power boats’ being won by ‘Betty’ at 30.95mph. The Marine Models magazine for December 1933 carried an article, ‘Betty and her Motor’ by John Innocent about the building of ‘Betty’. He carried on writing this monthly column until March 1938 and it provided an interesting insight into not only the building process but also that John was not afraid to state his point of view. This was very apparent when a Mr Cox in a letter 1st February 1934 to the Model Engineer, broadly stated that he found kipperbox hulls ugly and why couldn’t they copy some of the more elegant full sized speed boat hulls around? John responded strongly with comments of ‘That beauty will assist performance must surely be a fallacy’ and Mr Westbury has a boat of the type Mr Cox favours and it neither runs smoothly or cleanly. Fighting talk as Mr Westbury did not take kindly to such criticism and filled two pages with a response. Captain Bowden, Cowper-Essex, Lionel French and several others got their pens out and joined in the discussion with things getting quite heated.At the end of one letter John wrote ‘Our speed is derived from our engine, which is much more our pet than the box it lives in’. This really gave ammunition to their opponents and in particular Lionel French. Lionel offered them his hull, which they could keep if it was successful. John’s reply was ‘instead of changing their motor into a hull of proven stability it would be better to put another motor in ‘Betty’s’ hull. By now it was well into May and with the hope of closing the discussion John wrote’ The Innocents ask all those interested to take greater care in reading correspondence or anyway to stop misreading it’ and finished with ‘Now if you will you must fight it out amongst yourselves for the racing season approaches and there is much to do’. French however had the last word ‘the letter of the Innocents adds nothing of interest or value to the discussion when they got 32mph out of ‘Old Bean’. They had three big helps, a good boat, a good engine and good advice accumulated during many visits paid to London Clubs before they actually made a start’. The Innocents answer to all this came in May at the Swindon and Bournville regattas where they won both the 500yd and 1,000 yd races. They also ran Pierre Marechal’s ‘Old Bean IV’ but things did not go well for that boat. A swan decided to cross the line whilst ‘Old Bean’ was on a run and while the swan retired with ruffled feathers to the corner of the lake, ‘Old Bean’ had to be fished out from the mud, keel first but with a swan’s feather as a trophy. This was possibly the last time they ran Marechal’s boat as he moved on to racing cars, eventually becoming a driver for the Aston Martin Team. John Innocent, Sam’s son remembers at a young age of being a passenger in a car driven by Pierre. ‘It was very foggy and yet Pierre drove at some incredible speed, with what appeared to be superhuman vision’. As an interesting aside, Jean-Pierre to give him his correct name was the son of a French film producer who had survived the sinking of the Titanic in 1912. Marechal’s racing career was tragically cut short in 1949 being killed whilst racing in the 24-hour endurance race at LeMans, following a crash caused by complete brake failure. As Betty’s speed increased the hull was found to have similar stability problems to other craft that John had commented on, and on a practice run just two weeks before the International regatta, the engine shipped a lungful of water and blew the cylinder clean off the crankcase. 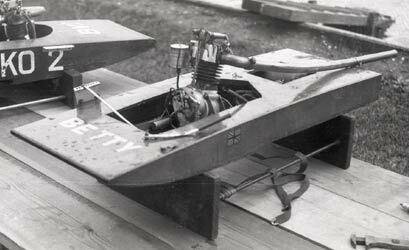 This would not be the only time that the engine would hydraulic and shear the cylinder barrel, but on this occasion some hectic work had the engine rebuilt for the regatta all to good effect as ‘Betty’ won the International Trophy and finished second in the Speed Championship. The boat also capsized at the Grand Regatta before it even started its timed run. In September the Brothers again travelled to France for the Paris International Regatta, this time accompanied by Stan Clifford with his IC engined ‘Crackers’. Gems Suzor narrowly beat ‘Betty’ in the 420-metre race and by a more significant margin in the 980-metre event. 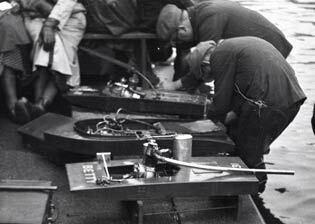 During the meeting ‘Betty’ sank by the start line but ‘the spectators were very much amused seeing the Innocent Brothers calmly dismantle their engine as water had filled the crankcase’. Fifteen minutes later it was reassembled and started normally. Hydroplane racing was put to one side in November when Sam married Margaret Bainbridge at St. Mary’s in Stratford. Sam had not followed his father and grandfather into the brewery business, his son John said that having been exposed to excess drinking as a child it was not the life for him. Instead Sam took an apprenticeship at Richard Thomas & Baldwin, boilermakers and later became a foreman at the Metal Box Company. He followed that by starting two transport companies, telling his son John that it was the hardest life style imaginable, driving all day, and servicing all night. Neither venture proved to be successful. Sam had met Margaret a nursing sister in 1928 whilst visiting his younger brother Lewis in hospital. Lewis had been involved in a serious motorcycle crash and unfortunately died seven days after the accident at only 20 years old. This was a tragic loss, but there was a happy outcome, as it resulted in Sam meeting his future wife. 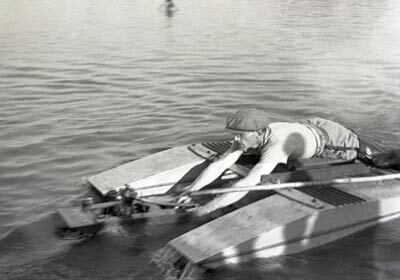 For the 1934 Model Engineer Speed Boat Competition, the Innocent’s submitted a run of 38mph, achieved at the Farnborough Regatta in the summer, which should have won Class A. However it was not to be as they were disqualified due to the tethering cord being too short, travelling 592.72 yards instead of the 600 required. The precise requirements of the Speedboat Competition would cause more controversy over the years and by contrast worked to the advantage of the brothers on other occasions later in their competitive careers. John would be quite outspoken in his column about the rules and officialdom. The following year the brothers encountered no such problems with the rules and took the A Class award, in the 1935 Speed Boat Competition for boats over 12lbs with a run of 41.18mph, ‘Betty’ weighing 14½lbs. The weight of ‘Betty’ was a constant problem due primarily to the motor being over 6lbs, twice as heavy as the one in ‘Old Bean’, which created difficulty in getting the balance of the boat right. This problem was recognised and John set about building an entirely new and much lighter motor cast from Electron magnesium alloy, although there is no evidence this motor was ever fitted. It does however survive and is a treasured possession of Sam’s son. 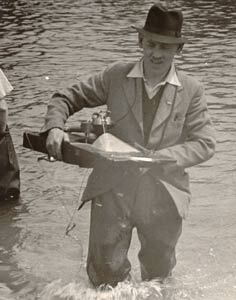 The first MPBA Regatta of 1935 was held at Victoria Park on the 5th May at the start of the Jubilee Bank Holiday. ‘Betty’ stopped on the third lap of her first run but in the second leg posted a time of 41mph, another new 30cc world record. The ‘Spectator’ (Lionel French) described the event thus, ‘I shall not forget this run, ‘Betty’ took up the line perfectly from the start, and running rock steady, proceeded to reel off the laps as though fastened to a steel shaft on a pivot. The effect of this speed on a hundred yard circle is more like 60 than 40mph and is nothing short of awe-inspiring. Actually the speed probably was considerably more than 41mph, as I noticed in particular that ‘Betty’ was still accelerating after passing the half lap-timing mark, and at this speed a second means more than 20 yards, and several mph. Messrs. Innocent are to be congratulated on this very stout effort. Incidentally, there is something for a good many people to learn from merely watching this team at work. All preliminary adjustments are made before the boat is taken from the stand, and it is hooked to the line before starting the engine. After this, there is no frantic instructions between them as to what wants turning off; in fact, there is no talking at all-each knows just the job he has to do, and does it with minimum of time and fuss. There are no haphazard adjustments, they know the correct positions for the controls to a hair’s breadth, and get them right 49 times out of 50. Experimental settings are tried out at practice runs, not in races, with the result that ‘Betty’ is not only our fastest boat, but our most consistent one too. This is not intended to be a song of praise for the Innocents; I am pointing out that they have brought to the game a common sense system, which plays no small part in their consistent success. The MPBA International Regatta at Victoria Park on June 5th was obviously not quite so well ordered as Betty failed on two occasions in the Speed Championships, stopping just a few yards short, of the finishing line. Although reaching 40.4mph in the International, ‘Betty’ was placed 2nd with Andrew Rankine and ‘Oigh Alba II’ first at 41mph. However in September at the Grand Regatta the Innocents took the Mears Challenge Trophy with Mr Rankine coming second. Whilst a fast speed eluded them at the Farnborough Regatta, they showed that in the towing competition Sam was a master at cornering and once again won the Farnborough Marrow contest with ‘Betty’.